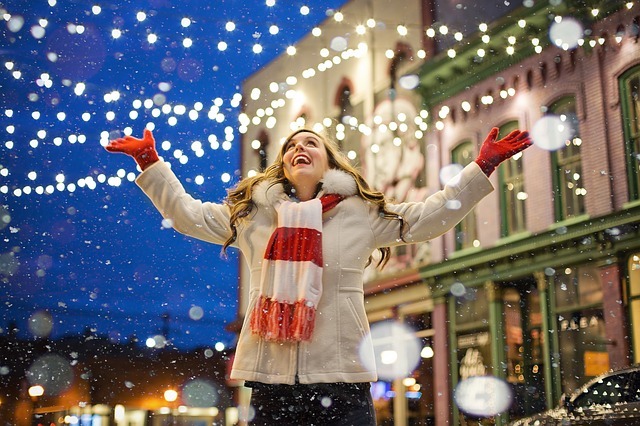 A few tips on getting your Christmas lights up and keeping a smile on your face! Justin Max, make life better, one day at a time! It’s the holiday season and for many, it can be a stressful time. There’s always so much to do in the span of a few weeks. Decorating your home with Christmas lights may seem like a challenge, but if you follow these tips you’ll have them up on your roof line in no time at all. As a bonus, you’ll also find a few ways to keep a smile on your face as you do it. Do you think of putting up Christmas lights as a chore that has to get done? Well, let’s change that right now. Instead of being something you dread, it’ll be something you look forward to. The best way to do that is to turn it into a party. Put on some music, order a pizza, and have some friends over. The lights will be up in no time at all and when you’re done you can watch a movie and drink some hot chocolate. Now that is something to look forward to with anticipation. Think of a few people you want to invite and give them a call. You really can get the whole family to participate in this. If you have young kids, give them age-appropriate jobs. They can hold the lights that aren’t being used, use the measuring tape to measure the ground or color pictures of what they want the final light display to look like. If you have teenagers, you can use this time as an opportunity to communicate. Ask them what they want to do during the holiday season and just listen to them. Maybe they’ll let you know what movie they want to watch when you go inside. Before you put your lights, plug them in and make sure they still work. This will save you a lot of time and heartache. Plug in every strand of lights that you intend on using. If they work, use them. If they don’t replace them. You’ll soon find that measuring tape is indispensable when hanging lights. You simply measure out the area you want to decorate and then measure that against the length of your lights. Do this after you check your lights to see if they still work. Once you know the length of the area you want to decorate, you just make sure you have the same length of lights. Have you ever looked at your neighbor’s light display and wondered how they got it to look so good? Want to know the “big secret”? They’re most likely using light clips. When you use them your lights don’t sag and they stay in place. They’re easy to use and will give your lights the nice even look you want. If you want to have your holiday display to go on every night without having to remember to do anything, then set your lights on a timer. You just set it to when you want the light show to go on and let the timer do the rest. That’s one less thing you’ll have to worry about. Once your lights up, take a moment to enjoy them. Be mindful about it! Look at the beautiful colors, taste your hot chocolate, feel the cool air, and listen to your holiday music. Now that is a reward for a job well done. Remember, the decision to have a good time is yours, so make putting up your Christmas lights a happy event everyone in your family looks forward to. I strive to live one day at a time and look for the good in every situation. Blogging about helpful tips helps me share what I learn with everyone.